Fresh as a Victorian garden, this lovely floral gift offers fresh roses in a charming ceramic teacup with matching saucer, both decorated with roses that bloom forever. Arrangement includes crème roses, pink spray roses, miniature pink carnations and pink limonium. 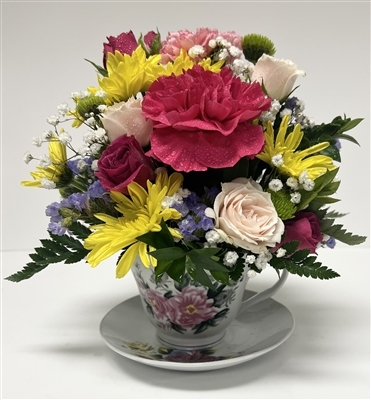 Delivered in a stunning ceramic teacup with matching saucer decorated with roses in the style of Victorian chintz.